You’re looking for an easier, more convenient and less expensive option. Thankfully, a portable air purifier offers such an option. In fact, it becomes a pretty easy decision to invest in one of the best air purifiers available today, to ensure the air around your living environment stays clean and healthy to breathe. But these devices are a plenty when you start looking online and go check out models in stores. You find units like the “Purezone 3-in-1 True Hepa Air Purifier” and you wonder: is Purezone a good brand? What does “3-in-1” really mean? And, what the heck is a HEPA filter do anyway? In reality, finding the best air purifier doesn’t have to be so hard. You just need to understand a little about brands, features and figure out how much you’re willing to spend. Using this buyer’s guide is an easy way to narrow down your choices…so when you do start looking at say, Purezone air purifier reviews you’re armed with some general knowledge about it and can compare with other models. There are so many things of which you should consider prior to investing in a purifier. To start, when you first set out in your search, you must first consider an indoor air purifier of which has the adequate quality that is sure to fit your and your family’s needs. For instance, if you or a loved one suffers from allergies, you should highly consider choosing a quality air purifier that is specifically designed for allergy relief. If this is the case, be sure to review models that feature HEPA filters and are also guaranteed to eliminate nearly 100% of airborne allergens. We should note here that HEPA-based air purifiers are famously regarded as easily the most reliable air purifiers available. These common airborne allergens may include pollen, dust, dust mites, mold spores, ragweed, and pet dander. Yet another common breathing complaint that drives many people to seek out air purifiers, is that of asthma sufferers. Or if one’s symptoms are specifically set off by chemicals or odor pollutants either from outside or inside. If this is the case for you or a loved one, you’ll want to look for a purifier that helps to treat symptoms of asthma or look for one that’s marketed as good for odors, chemicals or other unnatural pollutants. Yet another option is that air purifiers geared for smoke are also specifically designed to assist in removing different types of smoke based fumes such as cigar/cigarette smoke and fireplace soot, of which can additionally flare-up pre-existing respiratory issues as well as cause nasty odors in your family’s personal environment. Regardless of if you are seeking a general air purifier in order to better improve the air quality of your home or your office, while still creating an overall healthier environment, you are sure to be able to better narrow down all of your needs specifically, including color choice. One of the most reliable air purifiers today is easily the GermGuardian AC4825. Boasting a 3-in-1 Air Cleaning System with True HEPA, UV-C and Odor Reduction this little machine stands at a mere 22-inches and provides several levels of various cleaning levels to better capture countless allergens, while also eliminating bacteria and viruses in the air, while additionally destroying harmful mold and annoying odors. While the GermGuardian AC4825 is perfectly ideal for use in medium sized rooms and is CADR rated 100+, it is best to always be used as what is specifically advised in order to achieve maximum results. What is so incredibly effective about the GermGuardian AC4825 is that it is so incredibly simple to comprehend and utilize. To start, the charcoal filter and the pre-filter come together to actually capture larger particles such as lint and dust, along with destroying so very many common odors in your home or office. Next, the HEPA filter kicks into gear to capture almost 100% of all airborne particles. So very many of which are sized at 0.3 microns, that can be related in similarity to mold spores, pet dander, dust mites, plant pollens, and other debris. In fact, according to the American Academy of Pediatrics Allergy & Immunology (the AAPAI), agreeing doctors recommended that HEPA air filtration systems be implemented to reduce exposure to indoor asthma triggers. Save both the environment and your money with the O-Ion B-1000 Air Purifier. With the assistance of the incredibly reliable ionic and electrostatic air purification system, you will find yourself comfortably utilizing the essential technology of UVGI in order to successfully clean and purify the air in which you breathe. Along with the carbon filtration that has been designed to eliminate odors and while the electrostatic purification system does its part to eliminate and also reduce airborne particles and other irritants. With the super helpful attribute of the UV-C ultraviolet light, you will find incredibly reliable help with regards to the elimination of bacteria and germs in order to successfully purify the air of your home or office. While many air purifiers offer several speeds for maximum comfort, the O-Ion only gives off 2 fan speeds: Low (quiet for sleeping) and High (for increased air circulation). The good news, however, is the fact that the company provides some really spectacular incentives such as a 20-day money back guarantee if for any reason you find yourself unsatisfied with your purchase. Let it be said that the Honeywell 50250-S True HEPA Air Purifier offers some pretty substantial benefits; at an affordable price. Particularly for larger spaces, in fact, this option was created with large spaces in mind! This air purifier boasts a HEPA Filter which significantly assists in capturing and eliminating airborne particles. The Honeywell 50250-S also significantly assists in reducing the overalls dust, mold spores and pollen in the air of your home or office. The Honeywell 50250-S additionally boasts 3 different cleaning settings an an indicator that tells you how much the filter is consumed. One great benefit of the Honeywell 50250-S, is that with the extended long-life of the HEPA Filter, vacuuming it will only extend the filter life and it will actually only need to be replaced every 3 to 5 years. The HEPA filter is additionally glass fiber, which means that it is fully capable of capturing upwards of almost 100% of the smallest of particles! Additionally, it also has a pre-filter assists in capturing larger airborne particles such as fur, lint, and dust while also helping to reduce odors. This little guy packs a ton of high-efficiency air purifying capability! The Holmes HEPA Desktop Air Purifier boasts a filter to assist in the removal of airborne particles and dust allergens that are caused from indoor air. The carbon filtration system even helps to reduce unpleasant and foul odors upwards of 44%. And the convenience of the dual-position and super slim design is perfect for tabletops or desktop usage. The incredibly handy filter is also very easy to change and it even comes complete with a helpful indicator that tells when it is time to change out the filter. The Holmes HEPA Desktop Air Purifier also boasts three convenient speed settings that provide different setting options for different conditions, along with an optional ionizer of which aides in advanced particle removal. The GermGuardian AC5000E, 3-in-1 Air Cleaning System, is yet another super affordable option for pretty much any price range. It should be noted that the GermGuardian AC5000E, is ideal for use in larger sized rooms and it cleans upwards of 20% more than comparable models, such as the GermGuardian AC4825. The GermGuardian 5000E stands at 28-inches tall and is CADR rated at 125+. The pre-filter and a charcoal filter come together in unison in order to capture large, thick particles such as dust and lint, while at the same time reducing an abundance of common household odors. The HEPA filter then works its magic to capture at least 99.97% of the remaining airborne particles, ones that are as tiny as 0.3 microns most commonly found particles of which are found in the home are debris, dust and dust mites, plant pollens, pet dander and mold spores. The UV-C light technology then comes into play by way of working to assist in successfully eliminating many common airborne viruses, as well as bacteria and mold spores. Not to mention the fact that with the assistance of titanium dioxide, the GermGuardian helps to decompose odor molecules that are commonly caused by way of cooking, smoking and your furry loved ones. There is such a wide abundance of so many allergens floating in the air that we breathe. And with that thought in mind, it truly is no surprise that all year long people seem to be suffering from endless allergies followed by nasty colds and flu virus’. While the worst seasons of allergy suffering comes in the spring, followed by fall, summer and finally, winter. And, if you happen to have pets in the home, there is no correct or set determination of when your allergies will in turn flair up. Thankfully, there is a better and more smart way to cope with seasonal or pet dander allergies free of the need of having to carry wads of tissues or allergy pills where ever you find yourself having to go. The answer falls in the way of the awesome and super affordable TrueAir Compact Air Purifier made by Hamilton Beach. The TrueAir Compact Air Purifier provides at least 99% of the HEPA-grade cleaning performance in an incredibly compact and lightweight design that will fit virtually anywhere in your home. The TrueAir Compact Air Purifier is also stylish enough to blend into any décor scheme and best of all, it won’t break your bank! The HEPA filter is permanent and will never need to be replaced. All you have to do is simply vacuum it clean for minimal upkeep. As previously stated, the high-performance HEPA filter captures and particulates over 99% of dander and airborne particles (such as dust, mite debris, pollen and even mold/mildew spores) as small as 3 microns within your home. It is additionally super quiet and compact, while still offering incredibly powerful air-cleaning performance. Don’t let its compact design fool you, the TrueAir Compact Air Purifier is effective in its performance for small, medium and even larger, 160-square-foot rooms. It even works both horizontally and vertically, so that it is quite easy to move from place to place throughout your home or office as desired or needed. It even offers three speed settings for convenience. You can set it on High for the fastest cleaning, Medium for all-day use, or Low when some quiet is required! f you are seeking a great bathroom or kitchen air purifier, look no further than the GermGuardian UV-C Deodorizer and Sanitizer! This compact and super cheap air purifier will fully provide any home of far more fresh and clean air. The UV-C technology successfully eliminates the DNA of the germs that are presented in your home by way of eliminating their capability of reproducing. Best of all the UV-C technology can kill those germs free of the usage of potentially harmful chemicals. As the GermGuardian is so compact and lightweight, it is also just as simple to operate as it literally requires no assembly or set-up, and fits virtually anywhere in your home! You simply plug it into an area wall socket in order to efficiently destroy harmful bacteria and ward off annoying odors. The wonderfully affordable PureZone 3-in-1 Air Purifier sanitizes the air in merely a few hours which of course makes your entire living area more comfortable, breathable, and most importantly healthier. The 3-in-1 Filter combines a pre-filter, an activated carbon filter, and HEPA filter all rolled into one. The modern and sleek design is sure to compliment any room in your home or office and is completely customizable by way of providing three different speed settings. The True HEPA filter is confirmed to be successful in eliminating at least 99.97% particles of which are 0.3 microns in size. And, the PureZone Air Purifier even provides you with a filter reset indicator that will clearly show you when it is time to change out your air filter. The PureZone even boasts an incredibly useful UV-C lighting option which incorporates a higher standard of air sanitation via the elimination of bacteria, viruses and germs. The PureZone administers the perfect solution to be sure that the air in your office or home is significantly more comfortable for anyone who may suffer from allergies, asthma or any other type of breathing issue. And, the PureZone is also protected by the Pure Enrichment’s 5-Year Warranty to ensure that your complete satisfaction is 100% guaranteed. With the AeraMax 300 Air Purifier you will be able to automatically detect and purify the air. The AeraMax 300 air purifier uses an advanced True HEPA Filter is complete with antimicrobial treatment in order to safely and efficiently remove almost 100% of particles in the air of your home; of which include but are not limited to ragweed, pollen, ragweed, germs, viruses, mold spores, cigarette smoke, and dust mites. The carbon filter even will reduce odors within a 300 to a 600 square foot area, perfect for virtually any area of your home.The air purifier also comes with an incredibly special high-performance mode setting that greatly helps your health during allergy, cold and flu seasons. With the help of the AeraSmart sensor, you will be able to take advantage of the automatic detection agent which will automatically begin to purify the air. The True HEPA filter and the assistance of the AeraSafe antimicrobial treatment system will thoroughly and safely remove almost 100% of all the airborne particles in your home. A worthwhile investment and a great item on our best air purifiers list! One of the top air purifiers available today is the Alen BreatheSmart! Rated with the best-in-class performance, the Alen BreatheSmart Customizable Air Purifier with HEPA-Pure Filter is the perfect solution if you or your loved ones suffer from allergies. The Alen BreatheSmart Customizable Air Purifier eliminates dust particles from the air to give your home an overall sense of cleaner and more breathable air throughout your entire home. This incredible air purifier is perfect for any room of your home. 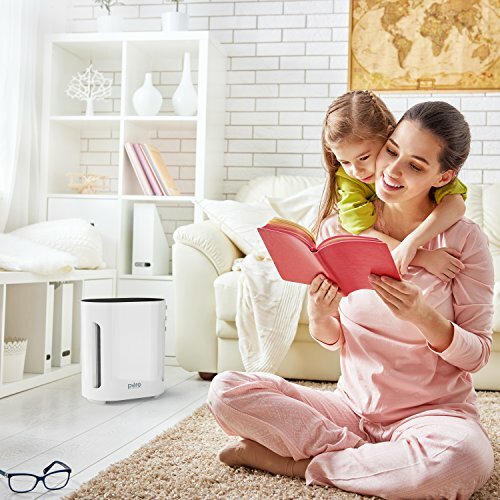 From living rooms, open concept rooms, virtually any other large rooms up to 1100 square feet, the Alen BreatheSmart is the perfect solution to quietly filter out and more than efficiently remove all allergens/dust, and will purify the air in under two hours! The breath sensor of the Alen BreatheSmart Customizable Purifier is the well-renown and exclusive SmartSensor that features automatic detection and will adjust itself to change your air quality, which additionally prolongs the life of your filter and in turn helps to conserve energy. With the additional feature of the WhisperMax technology that this incredible purifier utilizes you will note that pink noise is used in order to virtually eliminate all of the typical irritating high-frequency sounds. And when you enable the BreatheSmart purifier to clean the air, you can actually be able to enjoy the peace and quiet of your new cleaner home. The BreatheSmart purifier is also completely customizable and offers you four various filter options to be able to fully accommodate your need or desire to change your air purification settings. Not to mention the fact that there are ton of different panel color options that are sure to be the perfect match for your home’s décor. And perhaps most importantly, all of Alen’s air purifiers include a lifetime warranty, which guarantees that you will be experiencing a number of years of pure air for your entire home! And there you have it, the best air purifiers list for 2017! It should, of course, be noted that there are all too many important factors that one must seek to consider when it comes to the overall determining factor of what precisely your specific needs and desires are in terms of the overall purchase of your new air purifier. Not only the most obvious selection of what precisely your personal needs are with regards to the new air purifier of which you are the most interested in. One of the most important things that you must consider when looking for the best air purifiers on the marketplace is the sizing of the precise area of space that you are going to purify the air in. The best way to select the correct size of air purifier is to always be sure to take into consideration the size of the room that you are going to purify. You will also want to match that number to the square footage coverage that you will need in order to best select the properly sized air purifier model. If you are having any problems calculating the number, simply opt to utilize the air purifier’s CFM rate. The CFM rate can be used to figure out the square footage in order to get to multiple air changes each hour. After you have chosen the proper size and type of the air purifier that you are going to need, be sure to determine which special features, if any, you may want. There are a number of added features for air purifiers; some of which may include handles for ease of mobility, caster wheels, digital or remote controls, various fan speeds, timers that can be programmed, filter changing indicators, an air quality sensor, and so very many more. While these features most certainly add to the convenience of the overall operation of your air purifier, while also providing you limitless control of your air purifier’s overall performance, they are of course purely optional features and will not affect the overall performance in terms of the air purifier itself. Many people often are curious as to where the best place to keep their air purifier is to ensure maximum results. It is highly recommended that you put the air purifier within a bedroom as for the most part that is where you tend to spend the vast majority of time. It should be noted that air purifiers that are portable are specifically created to only purify air in only one room at a time, so it may become necessary at some point to make an investment in more air purifiers if you want to clean the room in every area of your home. This is actually one of the main reasons why selecting a purifier that includes handles, handles, special caster wheels, even other added portability features that are sure to allow it to be significantly more easy to move the air purifier between rooms. If portability begins to become a nuisance for you, another option is a whole home air purifier, which is increasingly gaining in popularity. These units are designed to simply be connected to your home’s current HVAC system in order to purify the air as you cool, ventilate, or even heat your home. One final thing to consider is that if you are planning to use a air purifier that includes a filter, be sure to always replace that filter based upon the recommended changing intervals of the manufacturer in order to adequately maintain the air purifiers highest degree of pollutant elimination. Depending on precisely how many filters your air purifier unit must use, you may be required to replace the filters at various times. Make sure that you take into consideration the overall cost as well as the frequency of any filter replacements prior to investing in any air purifier. It should be noted, however, that there are in fact other variations in air purifiers that utilize ultraviolet light or heat to purify the air while also eliminating germs and other allergens and these particular models do not ever require filter replacements. When it comes to choosing the best purifier, there is most certainly quite a bit to consider. However, with the proper knowledge of what you are looking for and putting forth some adequate research, you can be sure to find the best one to suit your desires and keep you breathing happy and healthy!